When you think of visiting Barcelona your thoughts may instantly turn to promenading down the ritzy Passeig de Gràcia, taking in some Modernisme master pieces by the likes of Antoni Gaudí or Lluís Domènech i Montaner, meandering through the streets of the Gothic Quarter or El Born, or sipping cocktails at a beach front bar in Barceloneta. (All of which are excellent choices, by the way.) But did you know that in there is up and coming neighborhood that is truly changing before our very eyes? The once industrial area of Sant Martí, mainly centers around the barrio of Poblenou (pronouced “pob-le-know”), is increasingly gaining a reputation as a must-visit area in Barcelona. In fact, you may have spotted that Hi. This is Barcelona…´s Jordan Susselman has recently been referenced in a The New York Times article on the subject, which extols the virtues of this exciting and blossoming part of the city, paying homage to its industrial past and providing an overview of the reasons behind the renaissance that it is currently witnessing. (Click on the image to the right to be taken to the article). Such is the pace of change, largely thanks to the 22@ rejuvenation project, that it is often hard to keep up. Practically every time I walk down a street in Poblenou I am baffled by the number of new little cafés, bars, workshops and creative spaces that are opening up, along side other large-scale changes, such as the remodeling of the Glòries intersection, where Gran Via crosses Avinguda Diagonal and Avinguda Meridiana. Consequently, we really do recommend that you explore this vibrant and intriguing part of the city, and to help you get started here is a guide to just a few of our favorite places. 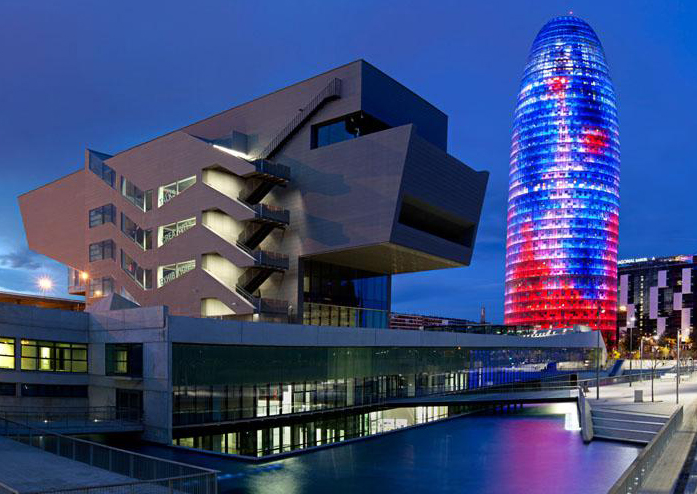 Sandwiched between the iconic Torre Agbar and the futuristic Encants Market, the Museu del Disseny de Barcelona opened its doors to the public for the first time in December 2014. In here you will find collections of all aspects of Catalan and Spanish design, including product, fashion, furniture, graphic, textile, and decorative arts. Built in the 18th century and once owned by the Framis family (hence the name), this converted textile factory has both permanent and temporary exhibitions of contemporary Catalan art. The park was designed by the French architect Jean Nouvel, who also designed the nearby Torre Agbar. Despite being situated alongside a portion of the busy Avinguda Diagonal, the park offers an oasis of calm thanks to the walls that run along its perimeter, and features different landscaped zones. Address: Avinguda Diagonal, 130, 08005, Barcelona. Opening Hours: December – February 10:00 – 18:00, March and November 10:00 – 19:00, April and October 10:00 – 20:00, May – September 10:00 – 21:00. Metro: Poblenou (L4/Yellow Line). Tram: Trambesós T4 Line – Pere IV or Fluvià. A much more pleasant experience than the better know “La Rambla” in downtown Barcelona, taking a leisurely stroll down the leafy La Rambla del Poblenou, and surrounding streets, is a great way to really get to know the neighborhood. As you walk down from the business and technology district around Avinguda Diagonal you can will pass lots of opportunities for al fresco dining. And if you follow this pedestrian boulevard to the very end you will reach the beach. Address: La Rambla del Poblenou, 08018 Barcelona. Metro: Llacuna (L4/Yellow Line) and Poblenou (L4/Yellow Line). Tram: Trambesós T4 Line – Ca l’Aranyó or Pere IV. For one weekend per month a disused factory building, a three minute walk from Selva de Mar metro station, plays host to this fantastic pop-up market. An excellent place for gourmet street food, bespoke designer goods produced by local artisans, arts and crafts, live music. creative workshops and child-friendly activities – there really is something for everyone. Note: Typically this market takes place on the first weekend of the month, but we recommend that you check the website for the market dates as they can vary. Many visitors to the city seeking some beach action make a beeline for Barceloneta, which is understandable given its proximity to downtown Barcelona. 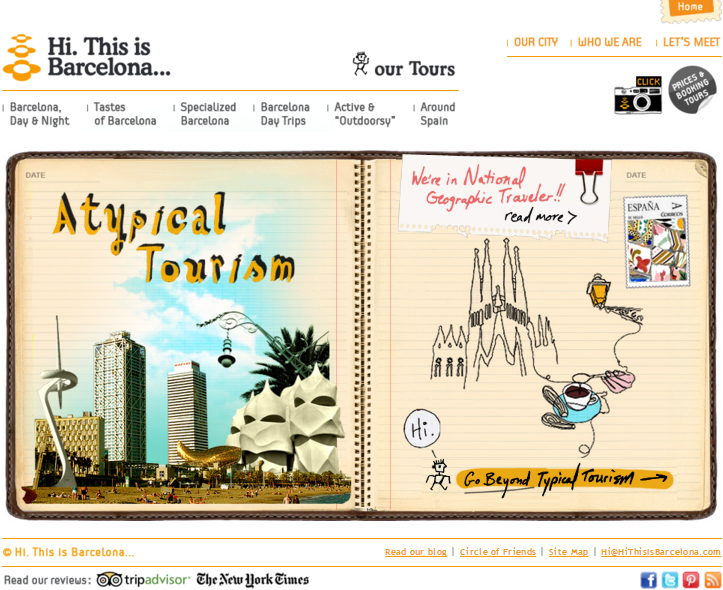 However, did you know that Barcelona has four kilometers of beach? 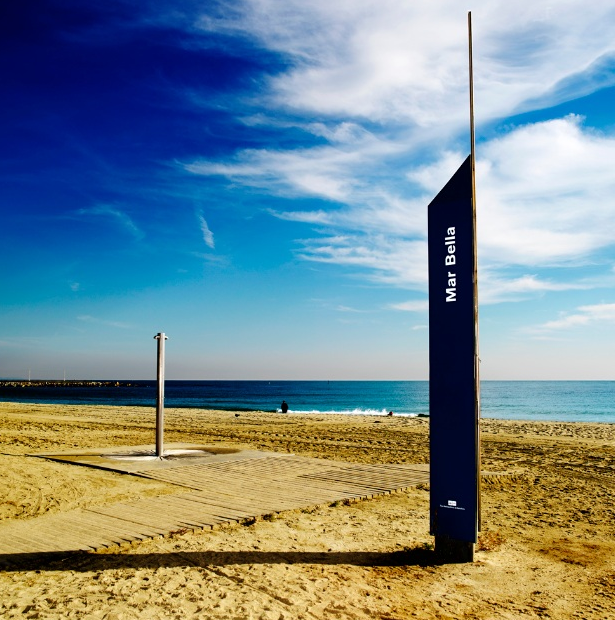 So, why not move a little further up the coast to enjoy some of the less crowded beaches that the city has to offer, such as Poblenou’s Mar Bella Beach. Not only is this a great location to top up the tan and take a dip in the Mediterranean, as well as being easily accessible from the end of Ramba del Pobelnou, but you will also find a number of beach-front restaurants and (during the summer months) chiringuitos, which are perfect locations to sip a refreshing glass of cava whilst people watching. Address: Passeig Marítim de la Mar Bella, 126, 08005. Metro: Poblenou or Selva de Mar (L4/Yellow Line). This entry was posted in Art and Design, Barcelona and around, Contemporary Architecture: Barcelona and tagged 22@, Avinguda Diagonal, Avinguda Meridiana, Chiringuitos, Encants Markets, Glòries, Gran Via, Jean Nouvel, Jordan Susselman, Mar Bella Beach, Museo Can Framis, Museu del Barcelona Design Museum, Museu del Disseny de Barcelona, Palo Alto Market, Parc del Centre de Poblenou, Poblenou, Rambla del Poblenou, Sant Martí, The New York Times, Torre Agbar. Bookmark the permalink.